It is the second Friday we will be in Israel and today we spent the entire day learning more about Judaism and how Shabbat is practiced and celebrated in Jerusalem. The morning started off with a tour of Yad Vashem, Israel’s renowned Holocaust museum. This was not the first Holocaust museum I have visited but I left more saddened, frustrated, and confused than I had ever felt before. We spent three hours walking through the different rooms, reading stories, hearing live testimonials and moving through the timeline of the saddest period in history. I felt with no better understanding of what went on during this time period than what I knew beforehand. I just had more questions and more heartache. How could something like this happen? How did the world just sit back and watch as it did? Six million Jewish people were killed during the Holocaust. I cannot comprehend how many people that actually is but I do know that there are currently 8 million people living in Israel and 6 million of them are Jewish. This does not help me put it in perspective but instead frightens me. I came to Israel only knowing as much as I had heard about on the news, all I knew was about the “unrest” in the Middle East. How can there possibly be all of this turmoil and controversy over such a beautiful city filled with kind and loving people? I felt uneasy for the rest of the day and I still think about the spoken words I heard from survivors about their loss, the way they survived, and the mental and emotional strength that was instilled in everyone to fight each and everyday with the hope that tomorrow it would all be over. I can never understand this dark period of time, but I do have a better understanding of how the Holocaust shaped the Israeli national psyche. We had to make a large mental and emotional transition to move into the Shabbat spirit. It would now be time to celebrate. Celebrate our lives, our friends, our families, our travels, and the beauty of life that surrounds each of us. Before indulging in a delicious meal, we made our way to the Western Wall just in time to see the sunset prayer, song and dance to ring in the start of Shabbat. 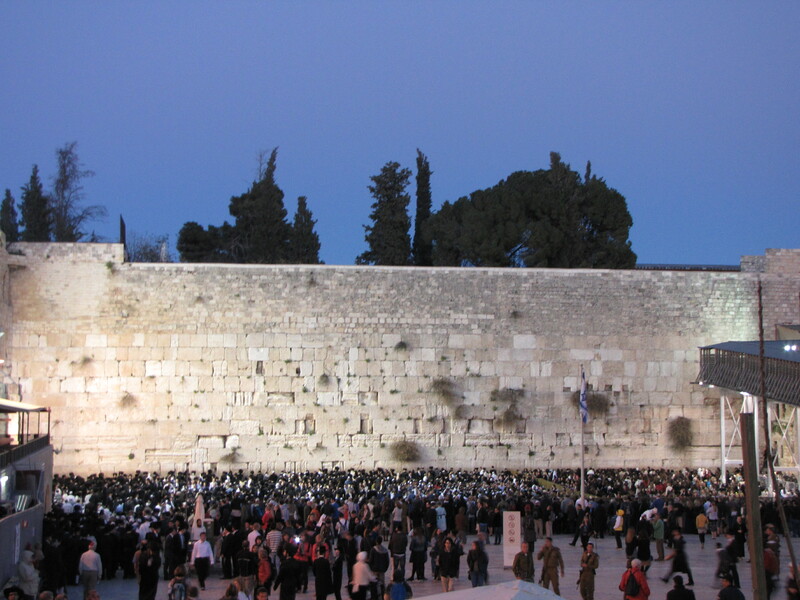 The Wall was filled with thousands of worshipers and men and women were not allowed to pray together. I took a step back to really get a feel for the crowd but from above it just felt like a mass of people. So I decided to get close and personal and say my prayer to the wall. I entered on the woman’s side of the wall. I was distracted by circles of women jumping, singing and dancing, others sat in chairs as they read the Torah. 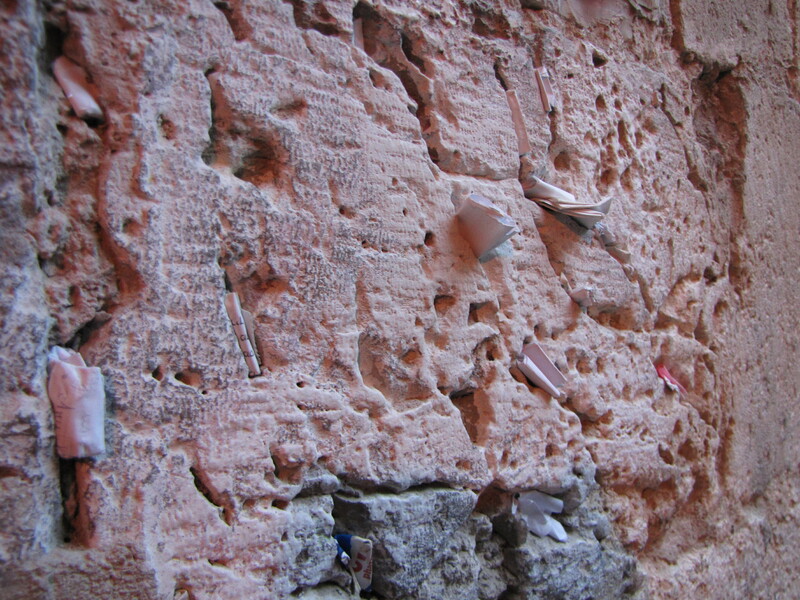 As I got closer to the wall I watched older women kiss the wall and young women write letters to stick in the cracks of the wall. I could feel the energy all around me. Some were sobbing, some were cheering, each person had their personal prayer that they went up to the wall with and the experience was extremely intimate. After I said my prayer, I joined back up with the group and it was finally time for some dinner! We were being hosted by a family who participated with the Shabbat of a Lifetime program and they were generously having all 24 of us over their home for a home-cooked meal. The night was filled with prayer, song and multiple courses of food. We started with a candle lighting, a prayer, a blessing to the women and children, a wine toast, the breaking of the Challah and the washing of our hands in silence. The night was filled with multiple courses and the wine kept flowing as toasts were made and the group joined in unison to yell “L’Chayim.” The night was extremely enjoyable and overly generous. We all left the house with new songs that we could not help but sing, new friends that we did not want to loose touch with and no desire to use any technology out of a newfound respect and understanding for the holiday. Hi Bianca, there is a small town in the Midwest that had a class about the Holocaust, since the students jr high and younger could not understand 6 million people they decided to do a school project. Collect Paper Clips, yes 6 million, people from all over the world sent paper clips some famous people too. They ended up with 6 million paper clips to so what to do with them someone donated a box car used to transport the Jewish people to the death camps and all the clips are housed in the boxcar which is now a museum. There is a movie “paper clips” telling the story.